The Ice Cream Museum began with installations in New York and Los Angeles (which are closed now) before heading to Miami and San Francisco. Each museum is open for a limited time. The mission of the museum is “to design environments that bring people together and provoke imagination.” Founders Maryellis Bunn and Manish Vora (of Lightbox) partnered with American Express to create this dessert themed fun house that “embraces imagination and creativity.” Bunn has said that the rooms she designs are a celebration of the ice cream she loves and her childhood dreams. The Miami museum is located in a 4-story art deco building in the Faena Art District. The building has fabulous ocean views It opened on December 13 and runs until February 26. The nine rooms are dedicated to the joy, fun and wonder of ice cream. It takes about 90 minutes to explore the whole space; tickets are timed so there is never a mass of people in a gallery. The museum is not a traditional museum but rather an immersive experience. This begins the moment you begin your tour. We were greeted by an ice cream fortune teller who after reading the ice cream Taro cards helped us decide our ice cream names- Kotton Kandy K, Dani Dynamite, J Swizzle, and Christy Dynamite. It’s easy to navigate the entire museum as each room flows into another. First, we visited the BUNNS SHAKE room which pays tribute to a 1950s diner and one of its most delicious, nostalgic treats- the milkshake. A conveyor belt along the diner counter served us mini milkshakes. 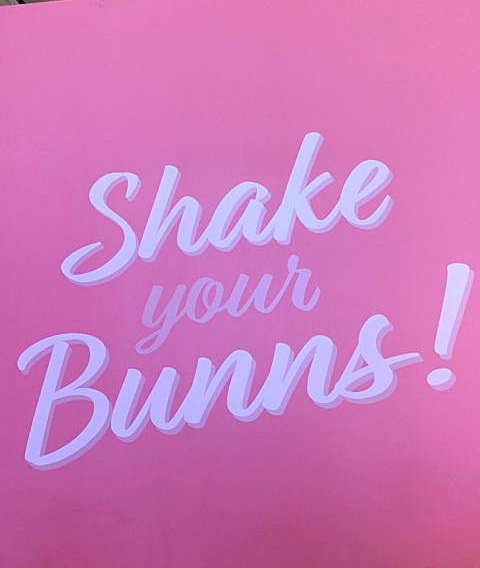 BUNNS SHAKE away! 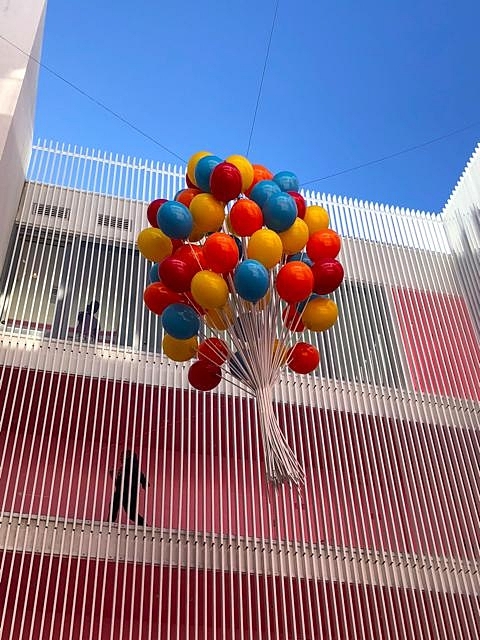 The path led us out to the building courtyard which featured a cool balloon sculpture. Major photo op! As you walk up to the other galleries, this sculpture is always in view. After passing through the courtyard, we ascended the stairs and entered my favorite room. This room featured a maze of life sized pink ice cream cones with fans. The bright colored walls created a room that looked straight out of a Lily Pulitzer catalog. Everywhere you looked was just so pretty and happy! But this room led to the wildest room in the museum- the pink jungle which included a forest of pink banana trees complete with two fruit swings. You could even crawl into a coconut room. In the banana jungle, we feasted on frozen chocolate covered banana popsicles. Definitely come to this museum hungry! But we were in store for more sweet treats. The Melted Ice Cream room contained a large refrigerator filled with milk and a huge candy bar. On one wall, a stack of letters enabled visitors to create ice cream flavors or leave a message. No Miami Beach museum is complete without a room paying homage to the beach sand! The museum does this in the most spectacular pink way. The sandcastle room was so fun to visit. Giant sandcastles built out of pink sand surrounded the room. Visitors could create their own masterpiece in the sandboxes with the pink sand in the center of the room. Exiting the room near a brightly rainbow colored wall just continued the happy feelings of our visit. One of my daughter’s favorite rooms was the Sweet Sculpture Studio. The gallery label challenged people “to explore their creativity though flavors, treats, and ice cream delights that are as grand and robust as your imagination.” The large ice cream and marshmallow sculptures allowed kids to climb and explore. The treat lay at the end of the gallery with a candy bar of gummy treats. My daughter was thrilled. Our last edible treat came on the top floor. Here we were treated to key lime pie ice cream cones. On a hot Miami day, this is the perfect treat. The entire floor with a large outdoor deck offers so many activities- ping pong tables, corn hole, and a fantastic view of the ocean. My favorite art piece was on this floor- a hanging tribute to colorful popsicles. After spending some time playing on this floor, it was time for us to venture into the main attraction- The Sprinkle Pool. 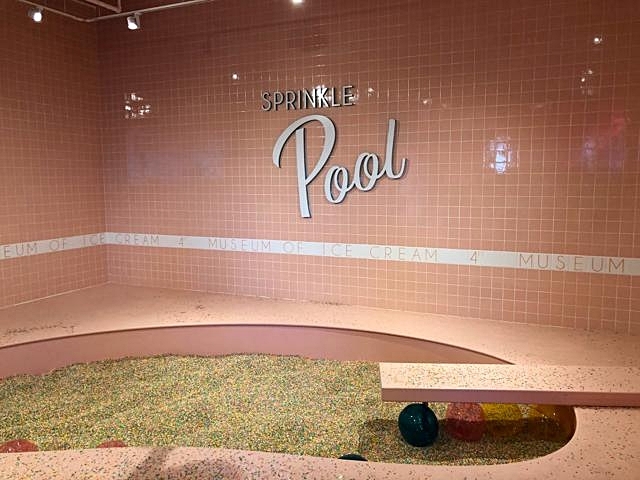 The Sprinkle Pool is located on the first floor and is the last gallery. Visitors have a 2-minutes time limit in the pool. The number of visitors in the pool is also limited. Entering the room is like walking into a pink, 1950 pool house. And the POOL! Filled with 11,000 pounds of “sprinkles,” the pool is a sea of waist deep rainbow colors. The sprinkles are actually made of plastic! 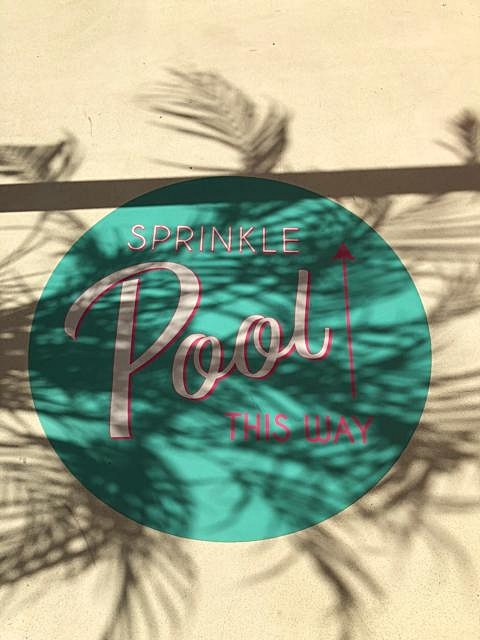 The Sprinkle Pool is the epitome of whimsy, imagination, and wonder. It’s just pure fun!!!! 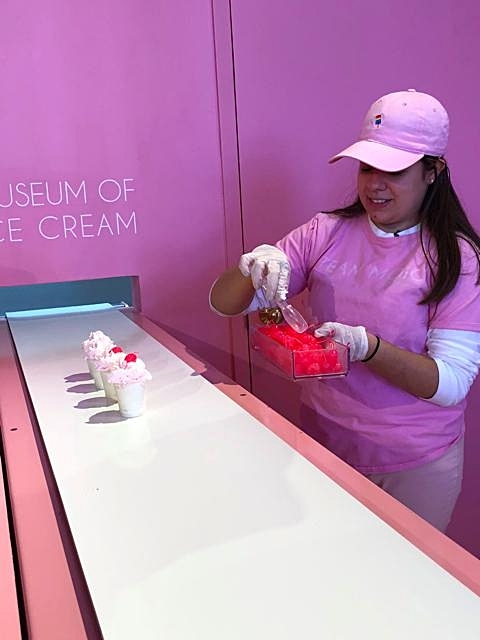 A trip to the Museum of Ice Cream Miami is pure joy. 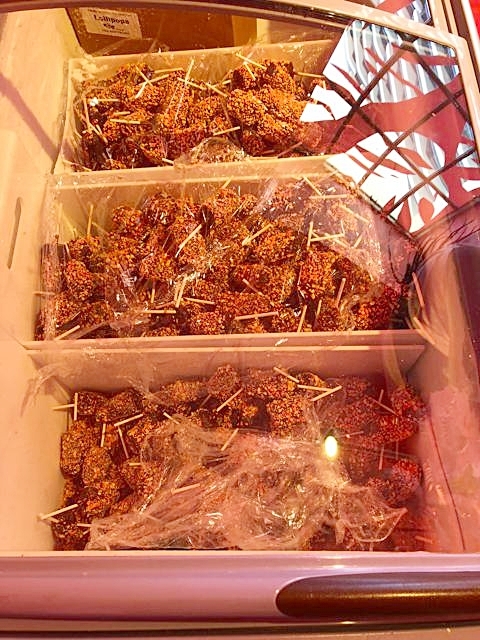 Go prepared for some delicious sweet treats! The galleries provided amazing photo ops and incredible Instagram posts. This is not a museum of scholarly art but rather a place to celebrate fun, fantasy, imagination, and of course, everyone’s favorite dessert, ICE CREAM!